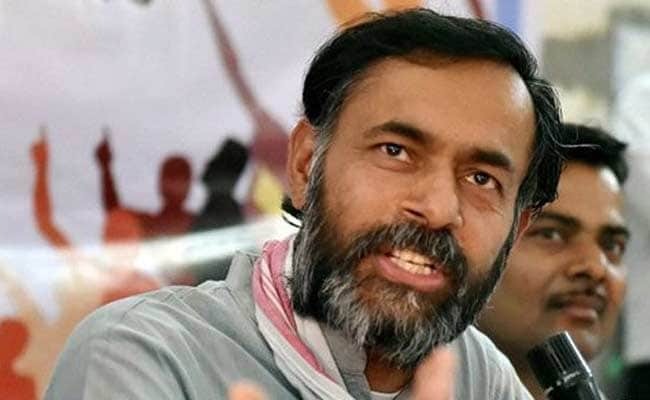 Yogendra Yadav had linked raids by income tax officials at hospitals run by his sisters in Haryana's Rewari to his campaign for farmers rights. He alleged the campaign had angered the ruling BJP. Yogendra Yadav said the tax raids were a standard tactic of silencing opposition. The tax department's searches at hospitals run by Yogendra Yadav's relatives were triggered by a Rs 3.25 lakh cash payment for jewellery bought from a Nirav Modi firm, an income tax department official said hours after the psephologist-turned-politician accused the centre of targeting his family to intimidate him. Tax department officials later said they had recovered 22 lakh cash during the searches. They said Mr Yadav's nephew Gautam Yadav had bought jewellery from the diamantaire's firm for Rs 6 lakh and paid Rs 3.25 lakh in cash. Tax officials had learnt of the cash transaction from the dossier of information about the group owned by Nirav Modi, the celebrity designer wanted in a $ 2 billion Punjab National Bank fraud case. Yogendra Yadav later told news agency PTI that "the question is whether this money is unaccounted for? I do not know about the accounts of the hospitals". On Wednesday morning, about 40 tax officials had reached Kalawati hospital and Kamla Nursing Home run by Mr Yadav's sisters and their family in Haryana's Rewari, about 100 km from national capital Delhi. They were accompanied by a large team of police personnel for security. Mr Yadav had tweeted details about the raids, alleging that a campaign led by him to mobilise farmers to demand better prices for their crops had angered the BJP that is in power at the centre and the state. The place and the timing of the "raid", he said, was planned "to send a message not just to me but also to the many farmers who are fighting for their rights", he said. A tax official, however, denied allegations that they had shut down the hospital and the intensive care unit, pointing that the CCTV video footage would contradict this claim. Also, the official pointed that four "caesarean section deliveries" and two normal deliveries also took place. BJP's Haryana unit also rejected Yogendra Yadav's charge that the raids were motivated. "Where is the question of intimidating anyone? If the Income Tax Department has found anything against anyone, let it do its job and the truth will come out," Haryana BJP vice president Rajiv Jain said.